I love a good memoir. There are few pleasures sweeter than curling up on the couch with someone’s story. I treasure seeing life through someone else’s eyes and I feel there is no better way to learn about history and culture and the human experience than reading a biography. So when Tim Challies reviewed and recommended “The Waiting” on his blog, I immediately reserved the book at my local library. Last week I managed to read the entire 300+ page book in two days. It held my attention, to say the least. “The Waiting” is the true story of a girl named Minka. The daughter of Dutch immigrants, she grew up on a farm in South Dakota. Horrifically, at the age of 16 she was raped and became pregnant. With the help of her mother and Lutheran minister, Minka went and lived in a maternity home until she birthed her daughter and—with great anguish—placed her for adoption. The author’s account of Minka’s excruciating decision to provide her daughter with a better life was, perhaps, the best part of the book. I was captivated by Minka’s heartbreak and the lack of power she had in her position. The memoir follows Minka through life, as she moved on and married and had two more children. Thoughts of her first baby were never far off and she wrote to the maternity home countless times over the years, hoping for news of her baby. 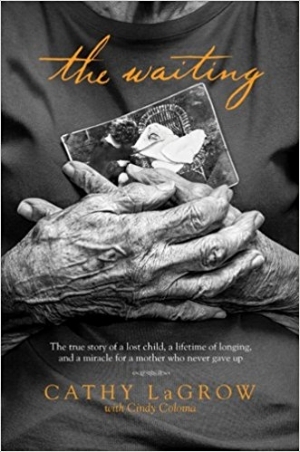 “The Waiting” culminates in an amazing ending when mother and daughter are reunited after two long lifetimes apart. Minka was 94 and her daughter was 77 when they finally met again—the account is almost unbelievable. “The Waiting” was written by Cathy LaGrow, who is Minka’s granddaughter. Minka’s children and grandchildren knew nothing of Minka’s first child until she shared her painful story with them at the age of 80. I so appreciate LaGrow taking the effort and time to write her grandmother’s story. It’s a rich story full of heartache and loss, but also victory and mercy. It’s a precious story that needed to be shared. It makes me wonder what stories live in the hearts of my loved ones that have yet to be told. In pondering the wonderful life that the adopted baby girl had indeed enjoyed, the author wrote, “Redemption had occurred, but something else was on its way, something that Ruth hadn’t expected but which would bring her abundant joy. Something that a very old woman had waited for nearly al her life… Restoration was coming.” There was indeed redemption for Minka’s baby, as she was embraced and loved by her adoptive family. And there was restoration when Minka and her daughter were reunited. These themes will nourish every soul that reads this book. If you’re looking for wholesome truth and a story that brings joy, add “The Waiting” to your summer reading list.